One Saturday, I chanced upon Kristin Lavitola lounging in her booth at the Irving Farmer’s Market. My family needed non-identical coasters at home that would help us identify our water glasses, so I had each of them choose from the different designs, while I chatted with her. She surprised me with her story on how she started her business, reinvented her life, and left behind a stressful corporate job to pursue her newfound passion. ​I had long wanted to feature inspiring stories of people, who took risks and found the courage to pursue their passion and purpose. ​That weekend spurred me to turn this idea into a reality. So here is her story and I hope you find as much inspiration in it as I did. How did you discover your passion? Who or what inspired you? I try to live by Thomas Edison’s quote, “I never did a day’s work my entire life. It was all fun.” When my corporate job started affecting me emotionally and physically, I decided it was time for a breather. I wanted to be my own boss, stop the long commuting and work from home, and, take time to explore art, writing, and travel without time restrictions because of vacation days. I resigned from my position as Senior Director of Marketing Communications two years ago. I decided to take a year or two off to follow my dream of starting an online swimwear company and attempt to pursue a healthier mind and body. Since swimwear sales are seasonal, I needed to find something else to occupy my time during the slower periods. I began using my free time to travel locally and internationally and visited museums as well as local art shows. Around the same time of my career change, we were decorating our new home. My boyfriend, Fred, works with interior decorators and is a professional art installer. We were having fun selecting art pieces for our home while at the same time educating ourselves on colors, shapes, structure, and history. 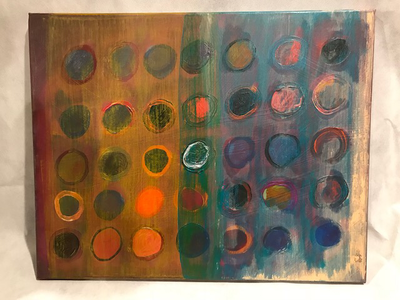 My inspiration comes from mid-century modern abstract art as well as artists such as Warhol, Picasso, Dali, Pollock, and Rothko. When was the turning point that you decided you’d pursue your passion? When did you break into the market? With that challenge before me, I began my journey by searching for painting 101 videos. I painted a few canvases and continued researching abstract art painting methods. One day I ran across a fluid art video tutorial. It was called beginner’s acrylic paint pouring. I couldn’t wait to try it out. I did, and it was addicting! You didn’t need a speck of artful talent to create colorful masterpieces. 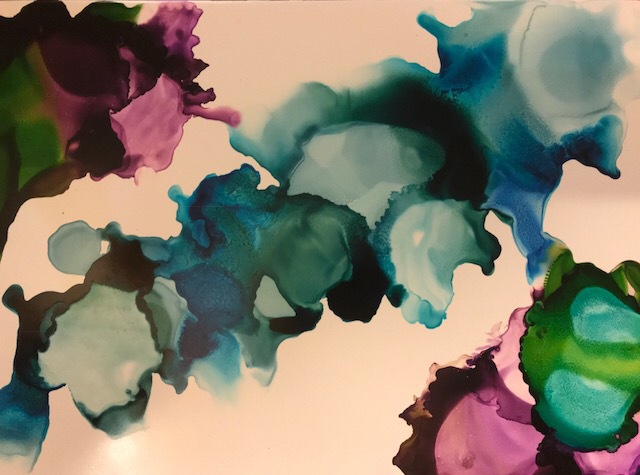 Soon after, I discovered alcohol inks. 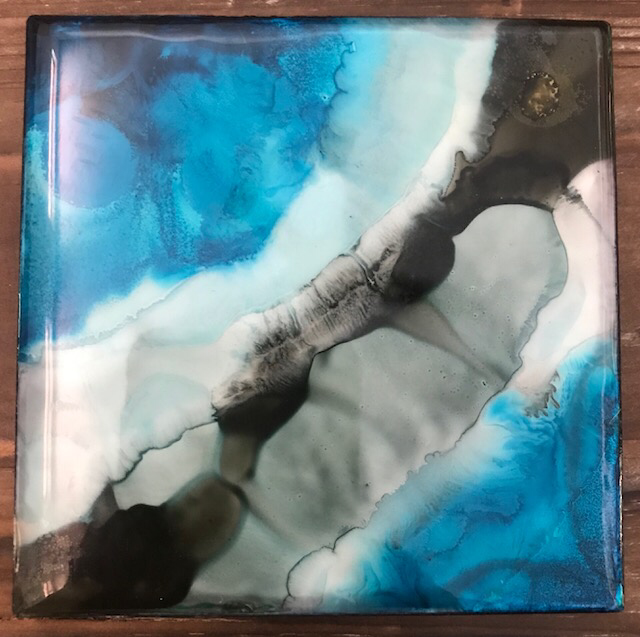 I began experimenting on Yupo paper, ceramic tiles and jewelry. After a few months, I had enough art and jewelry to sell at a craft show. Soon after that, I began selling at local farmer’s markets, launched a website and Facebook page, and a Facebook Group. Within 5 months, I had more than 2,500 members in my Facebook art fluid group and custom orders were starting to come in. 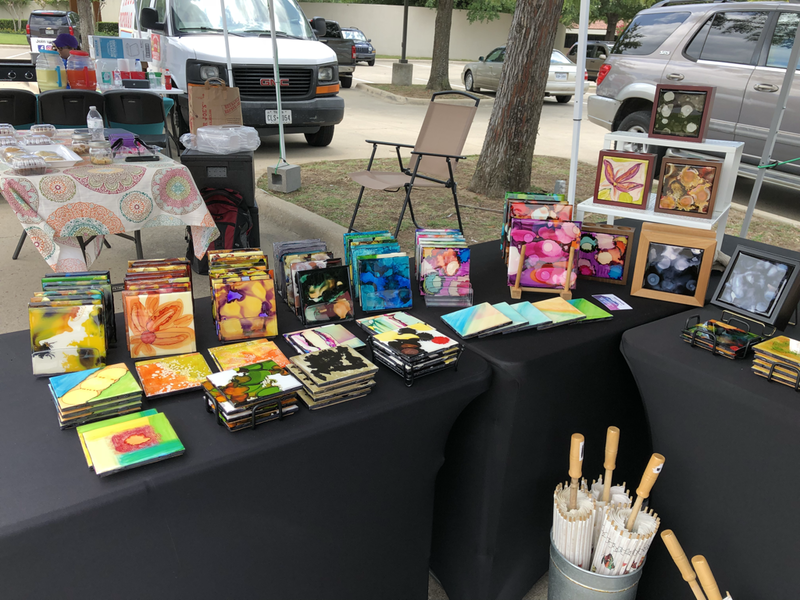 Currently, I sell my art and hand painted coasters in five local Farmer’s Markets and will be a vendor in local art shows. Not only am I passionate about my art, but I get to see people enjoy what I have created. Just knowing that they have my little pieces or art on their walls an on their tables brings me a sense of accomplishment and pride. I put my heart and soul into each piece that I create. Side note: the canvas is still blank and hanging above our fireplace – I haven’t decided what to paint on it yet! Fortunately, I haven’t really had any setbacks. It has been full steam ahead for the last year. If anything, I can’t keep up with the demand for my hand painted ceramic tile coasters. I have had complete support from my friends and family – which is important when making a leap of faith. When I started my art journey, I couldn’t draw a stick figure and never been to an art store. But very quickly, I discovered my niche after experimenting with no less than 10 different mediums and genres of art. I stumbled upon alcohol inking after trying the very popular acrylic pouring fad. Acrylic painting required a lot of space, supplies, and was very messy. Alcohol inks are efficient, dry fast, thus requiring less room, and you can create masterpieces on small surfaces. 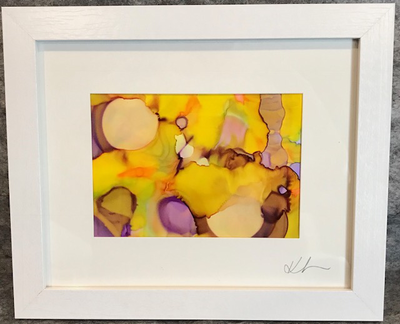 The vibrant colors of the alcohol inks and the flowing abstract designs are what have me mesmerized. I would like to be successful enough in selling both art and swimwear to afford me the time and financial stability to write a novel. My master’s degree is in professional and technical writing from NJIT and I have taken writing courses at Harvard University. I long for the opportunity to delve into fictional writing to begin to nurture my creative writing skills. If it’s fear, think about all of the things in life you are missing out on because you never tried. If it’s failure, think about everyone else that is doing what you dream of. Why can’t you do it also? If it’s money, change your plan. Make a budget and plan out your dream. Dreams don’t cost money, take it one step at a time. If you are good at what you do, the money will come sooner than you think. If you can’t change your profession, just try adding in little bits of your dream. Take time out to explore and develop your brain. You will find that it is an amazing feeling to accomplish small goals. If you are interested in being an artist, use the internet and YouTube videos to your advantage – but, don’t limit yourself. Go to art shows, galleries, museums, and your local farmer’s markets and craft fairs. But, don’t spend too much time watching others. Same as you won’t looseweight sitting on the couch watching a workout video, you won’t achieve your dreams watching YouTube. Get out there and do it yourself! Kristin Lavitola lives in Grand Prairie, TX for four years now, since the time she moved from Virginia after the death of her husband and hurricane Sandy struck. She met the love of her life on a business trip to Dallas and found her home here in TX. 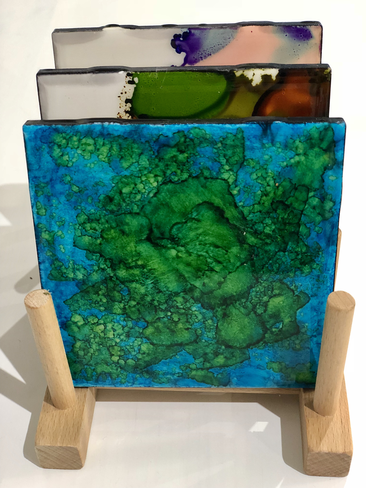 ​Kristin’s art and ceramic tile coasters are for sale at local art shows and farmer’s markets. You can view her schedule here: https://kipperdoodle.com/market-schedule. You can also purchase them on www.kipperdoodle.com. Her eBay swimwear shop can be accessed at www.swimparlor.com. ​There are more than 2,700 members currently sharing their techniques and art in her group. So there you go, folks! I hope Kristin inspired you to pursue your passion and find more meaning and purpose in your life.